The southern end of Gallipolis floods at the Chickamauga Creek in February. 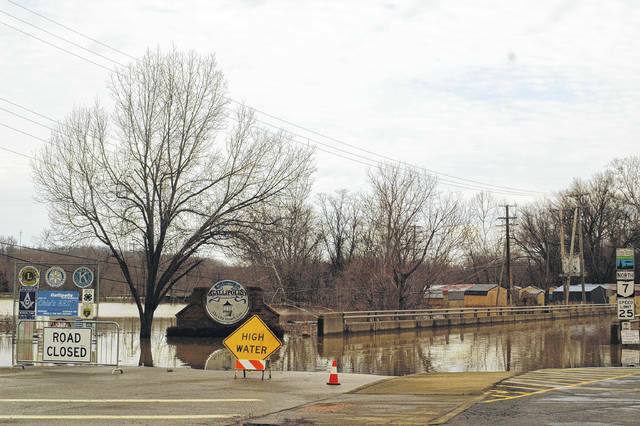 GALLIA COUNTY — According to Gallia Engineer Brett Boothe and Gallia Emergency Management Agency Director Sherry Daines, regional damage sustained over February flooding repair costs will be covered 100 percent by state and federal dollars. Boothe said recently the county will soon be repairing a slip on Bulaville Pike from flooding in 2015 and will be tackling flooding damage to roads that occurred in February now that funding sources have been determined. Over the next month or so, the county will be bidding repair jobs to contractors. Bids are put out on slips in order of severity and as soon funding comes available. Boothe said FEMA would pick up 75 percent of the damages done in the county. According to recent discussion with Boothe and Daines, normally the state would pick up 12.5 percent and local dollars must also match 12.5 percent to fund damage repair once costs have met a threshold. Due to the passage of Senate Bill 299, Ohio EMA will reportedly fund the 12.5 non-federal match for public assistance grants, said Daines. The engineer said the county may need to take a low interest loan at first because projects will need paid and finished and approved before the county can receive reimbursement funds from Ohio EMA and FEMA. Roads with slips still awaiting bids include Coal Valley, Rock Lick, Brumfield, Hannan Trace, Neighborhood, Kemper Hollow, Woodsmill, Cora Mill, Swan Creek, Pyles and Clark Chapel.